life can be a bit*h sometimes and i'm sure we've all been there, right?! but this weekend...my life is going to be a beach (literally)! i know i've been talking about this cabo trip for the past couple of months (here, here & here)! maybe it's because i've never gone to mexico with a group of girlfriends! it sorta feels like college spring break! well, i found this piece of art on etsy and i thought it went perfectly with my weekend getaway! 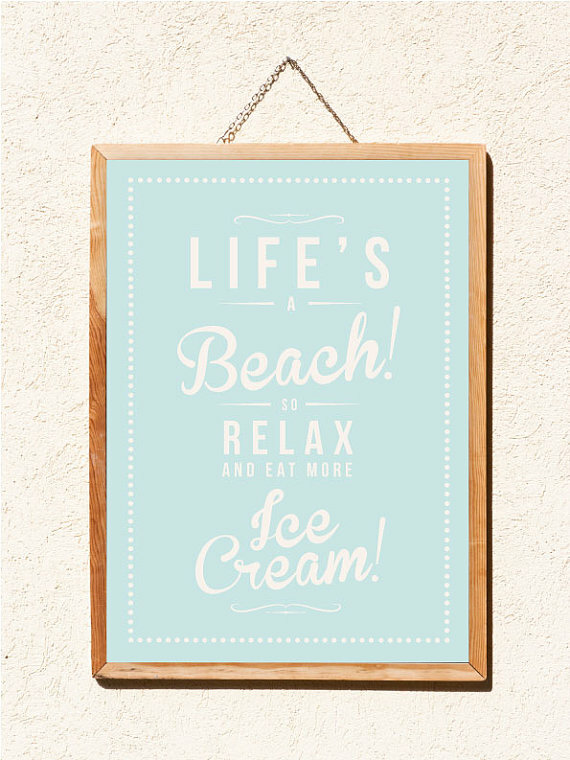 "life's a beach so relax and eat more ice cream!" "life's a beach so relax and eat/drink more ________!" this weekend, for me...life's a beach so i'm going to relax and drink more yummy cocktails! ok...gotta go to catch my flight! Oooooh...I'm beyond jealous. Nothing beats a girls weekend away trip. Have fun! Have the best time on your Cabo trip with all your best girlfriends, Jin! You earned every last cocktail you consume. :) See you when you get back. Yes, but it always turns around!!! loved seeing your photos on insta~ not sure if you're back but if you are hope you had a great time!!!!!!!!!!!!!!!! xO!